The lumbar spine is the area of the spinal column that comprises the low back. The lumbar spine is made of 5 vertebrae. Lumbar vertebrae are referred to by 'L,' prepended to an identifying number. The number indicates the level of the lumbar spine in which the particular vertebra is located. Each region of the spine (i.e., the cervical, thoracic, lumbar and sacral regions) have their own numbers; the bones of the lumbar spine are numbered from L-1 to L-5. Below the lumbar spine is the sacrum and below that, is the tailbone, or coccyx. The coccyx is the very last bone of the spine. A bony ring with several pieces and areas attaches to the vertebral body in back. 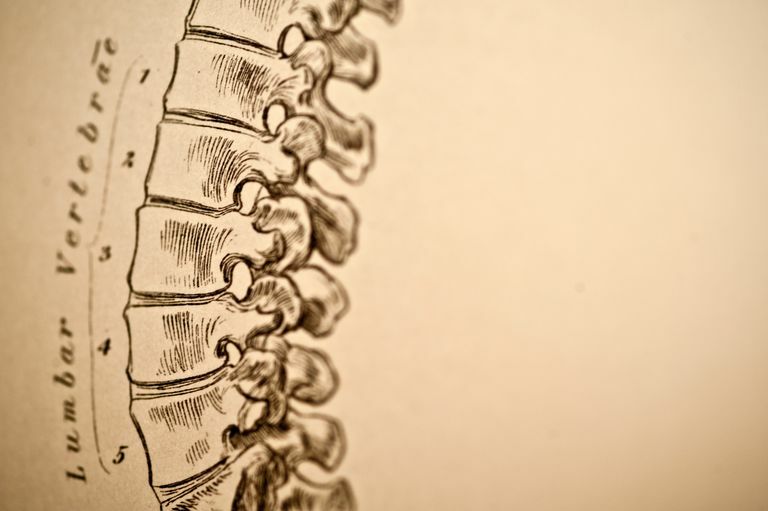 These pieces do a number of jobs, from providing attachment sites for ligaments and muscles to making arches through which the spinal cord and spinal nerve roots pass, and forming joints that help maintain the spine's upright integrity. Each area of the spine is curved, and the lumbar region is no exception. Curves alternate directions in the spine to help provide balance and support for movement. In the cervical (neck) and lumbar spines, the curve goes towards the front of the body when you look at a side view. This is called a lordosis. A normal lordosis has a degree of curve that is not excessive, but experts don't really know what that measurement is, exactly. Spondylolisthesis occurs when a spinal bone slips forward, relative to the bone below it. It is a form of spinal instability (see below) and is a progressed version of spondylolysis, as well as pars defect or pars injury. Facet joint hypertrophy is a pre-arthritic condition that can happen in any area of the spine, including the lumbar area. Spurs are another arthritis related spinal condition. Back mice are fat masses that protrude through the fascia in the back; they are often misdiagnosed. Spinal instability, which may be caused by a number of things, usually results in a lack of ability to support your weight effectively. It comes about when problems in one or more of three spinal "sub-systems" occur.